SUNNYVALE, CA--(Marketwired - Jul 9, 2014) - Flipora, the fast growing, mood-aware website recommendation engine can now automatically learn what a user is interested in to make contextual and mood-aware website recommendations. 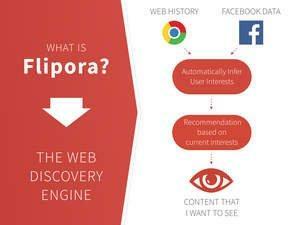 Flipora uses sophisticated artificial intelligence technology that taps into web browsing history and Facebook activity to accomplish this. The company announced this update alongside a complete redesign of its web-based application and several new features. The fast growing Flipora service is also on the cusp of crossing 30M users worldwide. For most users in the world today, discovery of websites happens in a largely accidental and unstructured manner on services like Facebook and Twitter. Since Facebook and Twitter don't know what a user's current interests are, the websites one discovers in their Facebook feed are largely generic and random, driven by what their friends want to share and not what they want to see. With this update, Flipora's algorithms constantly adapt and evolve with a user's changing interests so that the recommendations are contextual, mood-aware and up to date. For example, if a user has recently been browsing content related to Soccer, Rock music and Comics, Flipora's recommendations would be primarily websites relating to those topics. At the same time it allows one to tweak and change those interests, so that Flipora does all the hard work for you through automatic personalization, while you stay in control over managing your interests. Users can begin trying out Flipora's mood-aware website recommendation engine at Flipora.com. Flipora was initially launched from a dorm room at Stanford University where the Flipora founders Jonathan Siddharth and Vijay Krishnan met while pursuing their graduate studies in Computer Science. The Flipora founders envision a world where A.I. based personalization completely revolutionizes content discovery online. Flipora's Technical Advisory Board includes their research advisor at Stanford and former chair of the Stanford Computer Science Department Prof. Hector Garcia Molina and one of the creators of Google AdSense and former head of the Facebook Ads team, Gokul Rajaram. The team also includes engineers and computer scientists from Google, Yahoo! etc. Flipora also recently made the Top 10 List of Social Media Sites in the world in a list that includes other industry heavyweights like Facebook, Twitter and LinkedIn. The company has attracted an impressive roster of investors that include Draper Fisher Jurvetson, Labrador Ventures, Band of Angels, Amidzad Partners & Smiley Media. Flipora's technology helps users find content from the Web related to their interests that would otherwise have gone unnoticed. With the new browser extensions that have just been released for all the major browsers like Chrome, Firefox and Internet Explorer, the company is able to really tap into a user's mood to show websites related to what the user is currently browsing. Flipora offers this recommendation via a sleek slider widget that slides out unobtrusively from the corner of the webpage. This offers users a recommendation for a great next page to go to on the Web for whatever page the user is on currently. This option can also be turned off if the user chooses to. The new update also features a massive increase in the number of supported interests for users to follow. Users can now choose from nearly 3000 interests. This allows for more accurate and fine-grained personalization. The company has also confirmed that it has plans to further expand this set of interests. A user can set up their Flipora feed by following their interests and by following other interesting or like-minded users. This is important because by following interests one can discover new interesting users to follow and by following users one can discover interesting topics to follow which can further expand one's horizons. Unlike on Facebook, where a user is primarily connected to other users based on their social relationships, on Flipora a user is connected to a global community of users with shared interests. This vastly improves sharing since instead of sharing a website with hundreds of friends on Flipora, most of whom might not be interested in that topic, one can now share a website with potentially tens of thousands of users worldwide who are all interested and passionate about that same topic. Users with similar interests can now connect and share interesting content regardless of where they are in the world. The new recommendation engine also constantly improves as more users use the service since the website recommendations are sourced from the aggregate, anonymized web browsing data of the millions of users currently using the service. Flipora is an A.I. based recommendation engine that automatically learns your interests and then recommends websites to you based on what you're currently in the mood for. Today, web discovery is broken and left to chance on Facebook and Twitter. Facebook and Twitter don't know what you're currently in the mood for, and so you see websites in your feed that are boring and generic, driven by what your friends want to share and not what you want to see. Flipora puts the emphasis on you and what you're in the mood for right now and recommends websites based on your current interests. It is a mood-aware website recommendation engine. Starting out of Stanford University, Flipora now has nearly 30 million users and has raised Venture Capital from some of the best investors in Silicon Valley, with prior successes such as PayPal, Twitter, Skype, Tesla, Baidu, and Hotmail.